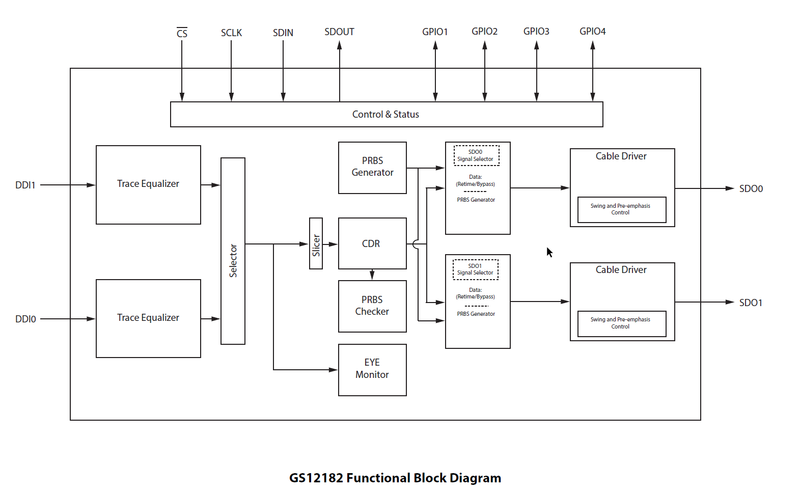 The GS12182 is a low-power, multi-rate, re-timing cable driver supporting rates up to 12G UHD-SDI, inclusive of 10GbE. It is designed to receive 100Ω differential input signals, automatically recover the embedded clock from the digital video signal and re-time the incoming data, and transmit the re-timed signal over 75Ω coaxial cables. Each of the 100Ω trace inputs support up to 17dB of insertion loss. With high phase consistency between scans and configurable space and time thresholds, algorithms can be deployed in the field to analyze long term signal quality variation (Bathtub Plot) to reduce costly system installation debug time for intermittent errors. The two cable drivers have highly configurable pre-emphasis and swing controls to compensate for long trace and connector losses. Additionally, automatic and user selectable output slew rate control is provided for each cable driver output. The GS12182 is pin compatible with the GS12181 and GS12281 single input 12G UHD-SDI Multi-rate Re-timing Cable Drivers, the GS12081 12G UHD-SDI Multi-rate Cable Driver, as well as the GS3281 3G SDI Multi-rate Re-timing Cable Driver.